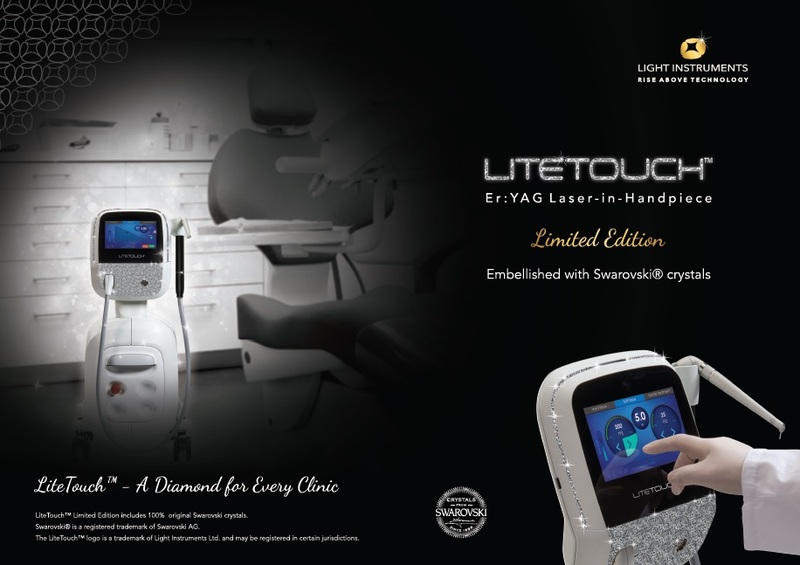 LiteTouch™ - A Diamond for Every Clinic - Light Instruments Ltd.
Light Instruments Ltd. has officially announced the launch of an exclusive limited edition of LiteTouch™, embellished with Swarovski® crystals. The LiteTouch™ Swarovski Limited Edition was first unveiled during the company’s annual Scientific Conference, which took place this year in Alaska, onboard the Celebrity® Infinity cruise. Light Instruments is in constant pursuit of creating the perfect dental laser experience, for both dentists and patients alike. LiteTouch™ intuitive and appealing industrial design contributes to a welcoming clinic atmosphere. Its design has already impressed the Red Dot jury winning the highly-coveted Red Dot Award for 2016. Now, with our partners at Swarovski, we have designed an elegant, limited-edition, the ultimate expression of the care and expertise that goes into crafting every LiteTouch™ laser we produce. 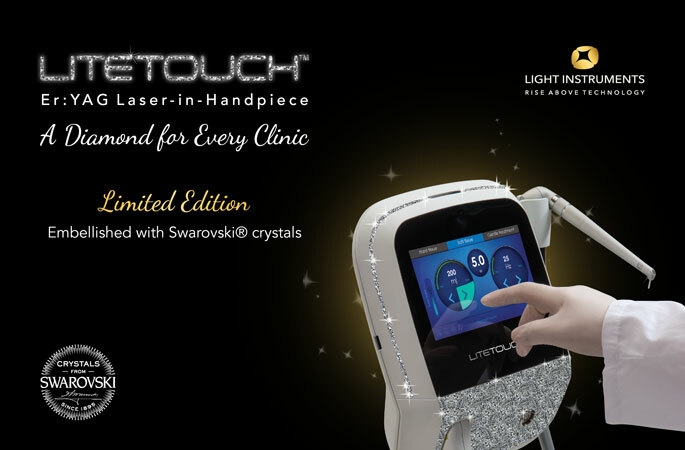 LiteTouch™ Limited Edition includes 100% original Swarovski crystals. The pioneering LiteTouch™ dental laser from Light Instruments Ltd. is completely changing the face of dentistry worldwide, making good oral health more convenient for patients and dentists alike. LiteTouch™ uses light energy to remove and heal all types of unhealthy dental tissues. When treating caries and other dental afflictions, the laser removes the decay very gently, leaving more of the healthy tooth unaffected – all without noise or vibration, and with significantly reduced pain. The LiteTouch™ device features the revolutionary Laser-in-Handpiece technology, developed exclusively by Light Instruments Ltd. This means that the entire laser mechanism is conveniently housed within the device’s handpiece. Small, simple, and easily-portable, LiteTouch™ is in sharp contrast to the bulky, complicated lasers on the market that hinder dentists’ movement. Thanks to its unique technological design, LiteTouch™ mimics the feel of the turbine drill while incorporating the unique benefits of laser devices: micro surgery, faster healing, minimal invasive treatments, and higher patient acceptance. By reducing anxiety and treatment delays, LiteTouch™ creates the optimal platform for preventive dentistry, good oral health, and overall well-being. The result is not only a happier smile for every patient, but a significant impact on public health as a whole, while also reducing complications and costs.